When planting lettuce, you can directly sow the seeds in the garden or start them in small containers and then transplant the seedlings. We prefer to directly sow loose-leaf lettuce seeds in our garden. We find it best to start varieties of Romaine, Bibb and crisphead lettuce in small peat pots and then transplant them when the seedlings are an inch or two tall. 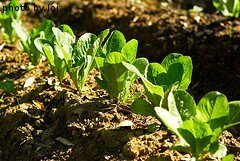 Lettuce can be planted in the garden a couple of weeks before the last expected frost in your area, when the soil temperature consistently stays above 45 degrees F. If hot weather is expected within 6 weeks of planting lettuce, choose a spot in your garden that will get some partial shade during the hottest part of the day. Areas around taller plants like peppers, tomatoes and eggplant work well as shady locations. You should also choose a heat-resistant variety of lettuce for best results. It's best to stagger your plantings every couple of weeks. This way, you will have a continuous supply of lettuce from late spring through late fall. You also will not end up with 2 dozen heads of lettuce that all need to be picked and eaten at the same time. Simply divide the area where you want to plant lettuce into sections. Plant each section separately, 2-3 weeks apart. Plant cool weather varieties in early spring and fall and heat tolerant varieties in summer. 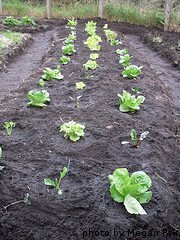 Begin by tilling the soil to a depth of 6 inches where you want to plant lettuce. When directly planting lettuce seeds in your garden, use a garden rake and scrape off about 1/4 inch of soil in the area where you want your lettuce to grow. Choose an area that gets about 4-6 hours of sunlight per day. For loose-leaf lettuce, scatter the seeds in the area you just raked, putting about 10 seeds per square foot. For Bibb lettuce varieties, scatter about 6 seeds per square foot. 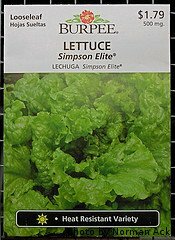 For Romaine and crisphead varieties, plant 4 seeds per square foot. After the seeds have been scattered, cover them with 1/4 inch of loose soil and tamp it down lightly. Then water in the seeds with a slow soak. When the Bibb, Romaine and crisphead seedlings emerge and are an inch or so tall, you'll need to thin out the plants. This is not necessary with loose-leaf lettuce. Thin the Bibb lettuce to 2 plants per square foot, keeping the most healthy looking seedlings. 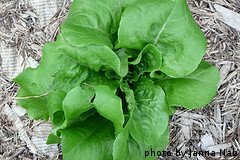 Thin the Romaine and crisphead varieties to a single plant every square foot. This will allow the plants enough room to grow to maturity without competing with other plants for nutrients and water. To start the seeds in peat pots, purchase the pots from your local garden center. These pots are designed to decompose after they are planted in soil. You will also need a good quality top soil or potting soil. Start planting lettuce seeds in pots about 3 weeks before you want to transplant them into your garden. Fill each peat pot about 3/4 full with soil. For loose-leaf lettuce varieties, put 2 seeds on top of the soil in each pot. For other varieties, put a single seed in each pot. Cover the seeds with a 1/4 inch layer of soil and water them in well. Place the pots in a sunny location that's at least 50 degrees F. Water them slowly every few days until the seedlings emerge. When the seedlings are an inch or two tall, they can be transplanted into the garden. Again, you can stagger the planting times to ensure a continuous supply of lettuce throughout the entire growing season. To transplant the seedlings, again choose a spot that gets 4-6 hours of direct sunlight per day. Use a trowel to dig small holes about 4 inches wide and 4 inches deep. For loose-leaf lettuce varieties, the holes can right next to each other and it's fine if the pots are touching after transplanting. When transplanting Bibb lettuce, space the holes about 6 inches apart. For Romaine and crisphead varieties, space the holes 1 foot apart. Carefully tear off the bottom of the peat pots, being careful not to damage the root systems of the lettuce seedlings. Place the pots in the hole and backfill any remaining space with loose dirt. Tamp down the dirt lightly and water the seedlings in well after transplanting. The same methods should be used if planting lettuce in normal containers. Choose a good quality potting soil or topsoil mix. Make sure that there are holes in the bottom of the container for adequate drainage and that the container is in a location that gets 4-6 hours of direct sunlight per day. For loose-leaf and Bibb lettuce varieties, any size container will work fine, as long as it's at least 6 inches deep. For Romaine and crisphead varieties, choose a container that's at least a foot wide and 6 inches deep. After the seedlings are a few inches tall, a layer of mulch can be put around the plants to retain soil moisture and keep the soil cool. Grass clippings or straw work well as mulch. You can also used damp newspapers and cover them with wood chips or chopped up leaves. Now that you're done planting lettuce, it's time to think about fertilizing and watering your crop for best results.